I got jailbreaking iPhone 6 with iOS 9. Silly me, I haven't backed up my iPhone before jailbreaking. So it is impossible to restore from iCloud or iTunes. Is it possible for me to find backup my lost contacts? You can't recover them. If no backup has been created, then recovery isn't possible. It doesn't matter if you use a jalbreaked or stock iPhone. That data is stored on a section that no application can be used to recover it. The backup through iTunes or iCloud is actually the recommended/safest way to recover the data when something bad happens. Check out whether there is an iTunes or iCloud backup, if not, you can try recovery tools. Recover Deleted Contacts from iPhone. To begin with, you need to connect your iPhone devices to the computer via its USB cable, then launch the program on your personal computer to bring up the start window. Select "Recover from iOS Device" to scan and get back your lost contacts from the iPhone directly. Hit "Contacts" option in the left panel and then you can see the detailed contents in the right panel. Go through them to find your target files ASAP, then mark the contacts you want to restore one by one. 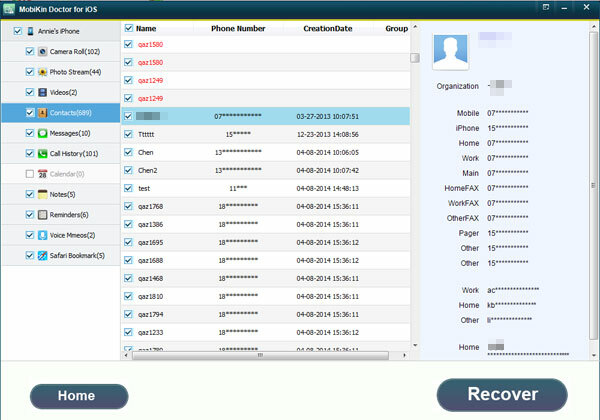 If you wish to restore the whole contacts list, you can check the all contacts with one simple click. You can get your lost contacts back via Syncios Data Recovery. I wiped my iPhone 5C last week, and this tool help me recovered all my contacts, SMS and other data, it even found my deleted photos. You can have a try. Coolmuster iPhone SMS Contacts Recovery is a good program designed for restoring. With it you can scan and recover deleted messages ,contacts from iPhone 4,iPhone 5,iPhone 6 etc. Usually, if you lost data from iphone, I think you can have a look at your iTunes or iCloud backup. be a good choice. Recover deleted contacts iphone.